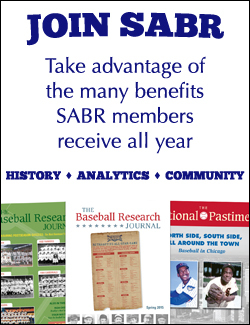 Read all articles from the Spring 2019 Baseball Research Journal online now. Listen to a new episode of SABRcast with Rob Neyer, our weekly baseball podcast. 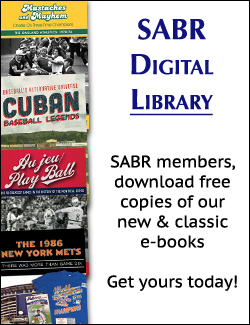 SABR's Connecticut chapter celebrates a hometown hero in our newest Digital Library book. 100 years after the 1919 World Series, SABR sheds new light on baseball's darkest hour. Listen to highlights from the Keeping Data Flowing panel at the 2019 SABR Analytics Conference. Join us for the SABR 49 convention on June 26-30, 2019, at the Manchester Grand Hyatt in downtown San Diego, California. Early registration is now open! The Manchester Grand Hyatt is conveniently located within walking distance from Petco Park, the Gaslamp Quarter, and the San Diego Central Library's Sullivan Family Baseball Research Center, home of the SABR Collection curated by our host chapter, the San Diego Ted Williams Chapter. Check out highlights, stories, and photos from the eighth annual SABR Analytics Conference, presented by MLB and KinaTrax, held on March 8-10, 2019, at the Hyatt Phoenix Downtown in Phoenix, Arizona. The SABR Analytics Conference brings together the leading minds in baseball analytics to discuss and debate topics relevant to the quantitative analysis of the game of baseball, including aspects of innovation and technology.